Annual participation in Community Day is our biggest contributor to the Scholarship Fund. Last year we received nearly $2400 and were able to provide 20 scholarships to Summer Art Camp classes! 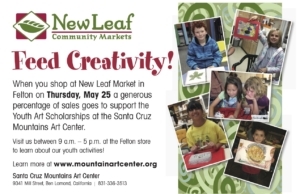 Visit us between 9 am – 5 pm on May 26 at the Felton store to learn about our youth activities.